Health and safety are obviously major considerations in the practice of media within education, be it trying to get some naive student to simply think about where they’re going to set up a tripod (i.e. not in the road) or perhaps to consider the risk level of a particular location we’ve chosen to shoot in (swimming pool??). Of all the Health and safety considerations the equipment that causes the most concern and risk must be lighting. 240v, live cables trailing everywhere to trip over, those cables attached to heavy lights high on stands to tip over and finally that’s not taking into account a few thousand kilowatts of heat to burn hands and set things on fire! Taking into account these concerns I was impressed to see a new type of ’studio’ lighting. We’ve all now got used to LED torches, which have now become the norm over normal bulbs, but seriously considering LED’s replacing powerful and accurate studio lighting (rather than a simple tiny torch bulb) is an altogether different consideration. I was delighted then to see a demonstration of a new 12 inch square LED light panel. 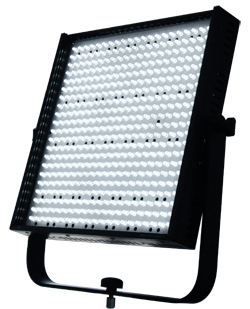 They come in various models and types, the basic models come in either Daylight or Tungsten available in either different angle spot or flood. One of the problems I’ve seen in the past with any LED light is the production of lots of circles of light, rather than any consistent light spread, but there was no evidence of this, just a even spread of light - how do you get a 15º spot from a flat panel I don’t know? Having a daylight temperature light without having to use gel is very useful. I measured the daylight output and it was about equivalent to a standard tungsten 300 watt light with blue gel. On a light meter the tungsten measured 3210k, which I’m told is actually within the tolerance of the meter itself!! - Not bad! There are other models available with over 3 times the light output of these models - although I’ve obviously not seen them yet. Each light has a built-in dimmer knob on the rear and DMX control socket - so both a dimmer and full DMX lighting control built in! Also there on the back is the 12v professional XLR 4 pin socket. It comes with a 12v mains adaptor, but will run a good number of hours on a battery - there is an adaptor option available to attach to the back of the light to take a camera battery should you need it. My thought was a good lead acid battery on a longish lead would make a good stand alone light and if the battery was attached at the bottom of the stand, it would act as a lighting stand ballast, making the whole thing hard to knock over. Having said that the light itself only weighs just over 2kg. Of the lights I saw, perhaps the most useful and impressive was the model called the ‘Bi-colour’. It was a little more expensive than the stand light, but on the rear was a second knob, where you could change the colour temperature of the light from tungsten all the way though to daylight and anything in between! Again no gels in sight! Very useful if you turn up to shoot in a room with mixed tungsten and daylight coming in through windows and you can dial in the exact colour temperature of the room at that time and even adjust as the sun comes down! Again available in either spot or flood. Don’t ask me how this is done, but there is also an adjustable focal length version in either tungsten or daylight colour temperature. Models are either 15º to 30º spot or 30º to 50º flood or a full 15º spot to 50º flood. On the health and safety front these lights make a huge case against the normal tungsten lights and well worth considering for studios or for use by students on location. A very safe option and ‘cool’ option! This entry was posted on Wednesday, May 26th, 2010 and is filed under Cameras & Lighting, Education & Teaching, Technical & Practice. You can follow any responses to this entry through RSS 2.0. You can leave a response, or trackback from your own site.